An important though unusual exhibition has just opened at the Kunsthal in Rotterdam. Important because it is showing a significant and unique relic of the Second World War, unusual because the old American Stars and Stripes is the only exhibit. 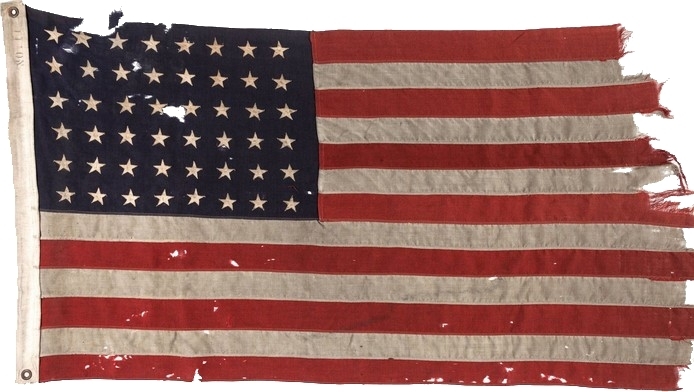 The story behind this battered and stained flag is one of many within the greater story of the Second World War – a story about freedom, which is told through a unique and tangible object. Arriving at the Kunsthal in a convey of old military armoured vehicles led by a WW2 M4 Sherman tank the flag was ceremoniously brought into the hall by personnel of both the Dutch and American military. Accompanied by a fife and drum band the flag was laid in front of the podium before speeches from Pete Hoekstra, the US Ambassador to the Netherlands, the Dutch Minister of Defence, Ank Bijleveld-Schouten and the flag’s current owner, Bert Kreuk. Music was supplied by members of the brass and percussion sections of Het Rotterdams Philharmonisch Orkest who not only played the Dutch and American national anthems but also gave a spirited rendition of Aaron Copland’s wonderfully evocative Fanfare for the Common Man. The 48-star American flag was flown from the stern of US Navy vessel LCC 60. On the 6th of June 1944, the day that would go down in history as D-Day, this ship lead the invasion fleet and the first American troops to Utah Beach. The guide boat was the first to reach the coast of Normandy, where the Normandy landings would pave the way for the liberation of Western Europe. The commander of the first landing craft was Lieutenant Howard Vander Beek, whose father was born in the Netherlands. Vander Beek took the flag and carried it in his backpack as a lucky charm for the rest of the war. Once at home, he kept the flag in a chest in his basement. After his death in 2014, the battered flag is offered up for auction and acquired by an art collector from Rotterdam, who lost family during the bombing of the city in 1940. It is the first time ever that the D-Day flag will be on display in Rotterdam. The D-Day flag will be on display until 17th February.